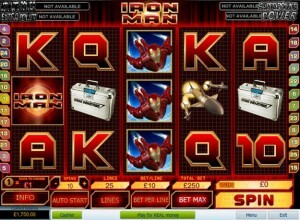 Iron Man Slots - Check it out at Lord Bingo NOW! Step 1 – Select your coin range with the up or down arrows in the Iron Man Slot: The minimum coin wager per line is 0.01p, while the maximum is £5 Across all pay-lines at a maximum bet this is the perfect wager for the high roller at £1000 – that is 200 coins – 10 per line. Step 2 – Click on ‘maximum bet' or select pay-lines and click spin to get ready for a reel- rolling adventure – auto-play is also available. Cross your fingers, the rest is up to Lady Luck, so let's hope she drops, expanding wilds, scatters, multipliers, or at least high-paying icons onto the pay-lines. Step 3 – When the reels stop, check out what you have won. The ultimate aim of the game is to get into the Missile Attack Bonus for massive multipliers or win the PJP prize. In this Marvel Comic themed slot, which initially came from the pen of Stan Lee, and more recently from Universal Studios; Playtech found themselves in a win-win situation after negotiating for the licensing rights and creating the iron man slot game. This is the first installment with Robert Downey Jr. playing the role of Iron Man and simultaneously Tony Stark – industrialist. The businessman is a master engineer who suffers a dreadful accident then builds a powered exoskeleton to become a technologically advanced superhero. The Iron Man slot machine is rendered true to the film property. Characters in the slot are also true to the film and feature mainly the Iron Man logo, a flying version of the same, Tony Stark, a suitcase a bomb and playing card icons. His is the most important role, and clips from the film also feature. This game is suitable for all slots fans and anyone who would like to play Iron Man slots free to try before they buy. The maximum prize is 5000 coins in the base game and there is also the Marvel Mystery Multi-Level Progressive Jackpot up for grabs. As previously mentioned Iron Man games are Playtech licensed and developed. They are one of the biggest and most successful online games developers in the industry.